How does Crash feel? Fuzzy? Soft? Maybe unexpectedly bristly? Going by the fact that we can actually see the individual strands of his fur now, I'm going to hopefully go with the former. Bringing back a twenty year old icon isn't easy, but Vicarious Visions has ushered him into the 21st century with one thing in mind. Those pesky feels. "It's got to be the feeling and I'm using feeling in two ways," explains producer Massie. "It's got to be the handling. The game relies so much on flow so that has to be in tact and as it was. But the feeling also has to be the feeling of playing the game. I think nostalgia's almost impossible to recreate. It can't bring back that moment 10, 15 or 20 years ago when you played with your dad, or siblings, or whatever, but I can bring back 'oh my god that sound is exactly how I remember' or 'oh my god it's so joyful, he's so cheeky.' Anything we add, or change or recreate faithfully has to evoke those same feelings. It has to be Crash. " And it works. From the moment you pick up your DualShock 4, the trilogy feels like the Crash Bandicoot of old. He steers around enemies the same, spins crates with that oh-so-familiar noise, and still has the kind of jumps that make you lean forward on your sofa just in case it helps your attempt to reach the next platform without being spiked/swallowed/toasted alive. 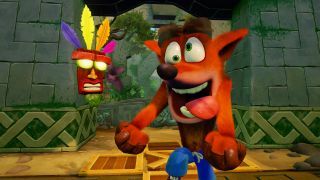 Throw in the fact that you can switch your controls to the directional buttons because the analogue sticks didn't exist when you first played Crash, and everything is here as you remember it. Yep, Crash isn't exactly Dark Souls but it's easy to forget that the original trilogy definitely wasn't easy on the old thumbs. The first Crash Bandicoot especially is a veritable Saw movie of deathtraps, complete with spiked floors, spinning blades and swinging guillotines in levels where the lights can go out. The N. Sane Trilogy is no different but thankfully all of Crash's entertaining dying animations have survived the trip to the future and Vicarious Visions has sprinkled in a couple more for good measure. I'm sliced, burned, exploded, and smacked with giant turkeys in the space of forty minutes, and still end up with a smile on my face, which has to be a good sign. Oh, and if you ever wondered why Crash 2 and 3 got slightly easier the more you died, they both used DDA - or Dynamic Difficulty Adjustment. This is back for all of the games here, so if things are getting a little too tricksy, you'll find checkpoint crates where there were none before and extra wumpa fruit crates to hand over those precious lives. The above gif really says it all, but there's a distinct pleasure in a '90s-style idling animation. Given the fact that this the winning entry of the Crash Idle contest that was implemented into the game, it's clear that Vicarious Visions has made the trilogy with fans in mind. And fine, I still like looking up from Instagram to see a character playing with a yo-yo because he got bored. Don't @ me. We all did it. We all found exploits that meant Crash could dodge around a deathly hazard instead of going over it. Well it turns out that Vicarious Visions did that too, meaning that after watching plenty of speedruns and players online, the studio has implemented a slew of intentional exploits. Massie is quick to say that she can't guarantee 100% of them are in there, but the team has built in as many as it could. "I think speedrunners will have some fun," she grins. "You can probably speedrun as you remember it, but also find new ways to speedrun. That's the thing we're careful of. If there was a secret or Easter egg that existed before, we want to honour that if not add some more... "
Remember how Crash Bandicoot looked when you first played it? Well, twenty years on and it finally looks like you think it did. Every level is ridiculously pretty. God rays filter down through futuristic buildings in Gone Tomorrow and the sunset is practically edible in motorbike chase Orange Asphalt. The fact that it's not even the same game engine means that everything has been crafted for peak prettiness with none of the restrictions of a classic remaster. Prepare for seriously attractive nostalgia to hit you in the face.